Earlier this afternoon, I wandered over to Southwark for a genuinely rare treat – a general open day at the London Fire Brigade Museum. By coincidence, just as I arrived, I spied Caroline of Caroline’s Miscellany coming out, so it was almost as if the London bloggers were on a tag team. One in, one out. 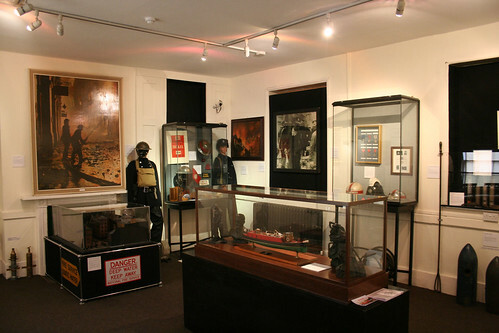 The museum itself is split into two buildings, one – a former fire engine garage holds the “big boys toys”, while a nearby building hosts a museum of smaller collectables. Going into the garage first, there is a smallish, but interesting collection of old fire fighting engines and some much earlier hand pumps. It’s a bit cramped in there, and difficult to get up close and personal with some of the really older stuff, but there is a big classic fire engine (with bell!) to excite people. In total, seven five engines – dating from 1750 to 1980 – are on show. As I wandered round the nearly empty shed, someone who sounded like a member of staff was overheard to comment that it was quite busy! As I left, a small army of children was being herded into the building. The remainder of the museum is housed in the imposing building next door. Built in 1820, Winchester House – for that is its name – was both home and workplace to London’s chief fire officers between 1878 and 1937. 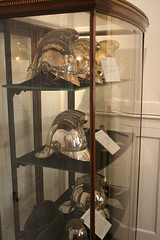 In here, things got a lot more interesting, as there are two whole floors full of memorabilia running from the early emergency of fire fighting and insurance, aptly just after the Fire of London in 1666, up to modern times. Laid out in the rooms which would have originally been offices and private quarters, this part of the museum took up most of my visit and is packed full of glass cases and displays to look at. The museum normally charges £3 admission, although today was free as part of the Story of London events – and even at £3 would be very good value for money. However, the place is not actually open to the public to visit! I exaggerate – slightly – the public can visit, but only by booking a tour with the museum, and only on Mon-Fri. This is a museum that is to all practical effect, closed to the average adult visitor. The museum reportedly gets around 6,000 visitors per year, and I am convinced the visitor numbers would soar upwards if only it was open on a Saturday! If it were a private museum, then they could do whatever they want – but the running costs come from a taxpayer subsidy of around £80,000 a year. Last year, plans to close the museum were scrapped, which is excellent news, but they really need to make it easier for us tax payers to actually visit the place. During the meeting to save the museum, it was noted that the museum doesn’t really appeal to kids, and is not interactive or modern. However, why does every museum now have to dumb down to the lowest common denominator and only appeal to children? What’s wrong with static displays of artefacts that people can look at? Does everything have to be in plastic day-glo boxes and computer screens now? I found it to be a very impressive museum – it’s just a pity that it is so damn difficult to visit the place. If change has to happen, then my personal suggestion would be to move the museum to a larger site, and try to merge it with collections from the other emergency services to create a “destination” that could easily rival the Transport Museum for visitor traffic. Just don’t make the traditional presumption that the only people who visit museums are school children, as some of us (childless) adults quite like visiting them as well – especially at weekends. Photos at my usual Flickr account. Have you spoken to anyone about it? Interesting to see their reasons for groups visits only? Hardly likely anyone but, shall we say, respectable, members of the public are likely to wander in randomly, so why they need a pre booked group is beyond me. What’s a group anyway? +1? +10? I’ve been on a press trip, is very interesting. Geek note: If you look at the map that the Trumpton Fire Brigade use, its actually of the city of Florence. How do I know this? Because it says “Firenze” on it. Ah, you’ve mentioned my personal bugbear – the notion that museums need to be ‘child-friendly’. What’s the point of getting children into museum-going habits if first, they see them as nothing more than indoor playgrounds and second, there’s very little to keep them going once they’re too old to be tempted by a few button-pressing gimmicks? And so say all of us. I suppose the thinking is that museums have to be “stimulating”, although my personal belief is that having it all given to you at the press of a button is the easy route. I suspect that many of us were fortunate to have inspiring and imaginative teachers and parents when we were younger and were “trained” to use our imaginations – something that children dont seem to be learning these days. However, it has to be said that a lot of museums are an embarrassment of riches and can be a bit overwhelming – far better to concentrate childrens’ attention on a couple of really good items than rush them around trying to see everything. This is where repeat visits to a museum pay off. Assuming, of course, that the museum is open when you want it to be…. 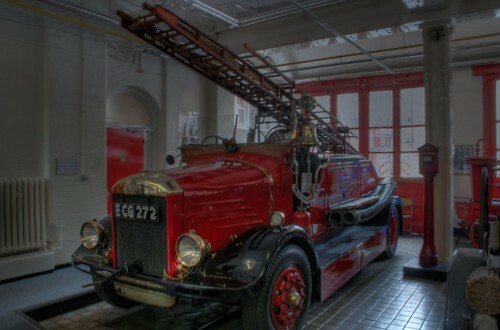 3 Pings/Trackbacks for "Visiting the London Fire Brigade Museum"